Food for Thought! : What an IDEA Sirjee!!! After long and unfruitful debates between the developed and developing nations, to save the Earth, here come a very different advertising strategy by IDEA cellular. The campaign extends its concern over the issue at the same time successfully manages to make an impression on the audiences. It isnt a rocket science! Save paper - Save tree, simple known fact, but the way advertisements has depicted the concept is really appreciable. 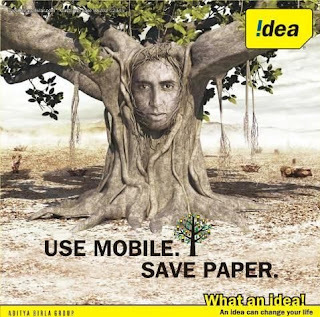 In first advertisement, Abhishek Bachchan, the brand ambassador of IDEA, plays the role of an agonized 'Tree'. He strikes the idea of using mobile phone to save paper, and therefore, the greenery around him. More and more people switch to their mobile screens rather using paper. The tree regains life and leaves the audience with a simple message - 'Use Mobile, Save Paper'. I liked the second advertisement more. A lady is shown bargaining for vegetables, she takes mobile number of the vendor and instantly transfers the amount to his account via mobile. I wonder if this trend actually picks up, the stuggling telecom industry can actually appear smiling again. The new campaign from IDEA abides by the essential brand promise of providing a simple, fresh and imaginative solution to a complex problem of the society. The new campaign has been developed by IDEA's creative agency, Lowe. 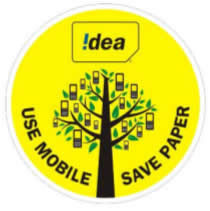 Some food for thought: Idea cellular can actually stop printing manuals and unnecessary papers for new connections, stop using paper in recharge coupons. Heard they are going to use news-PAPER i.e print medium to spread the message!!! I hope they set an example by following what they are preaching rather than just creating a buzz!